Photo Credit: LHL Designs has fashioned wine creates into gorgeous vegetable gardens fit for any sized farm! 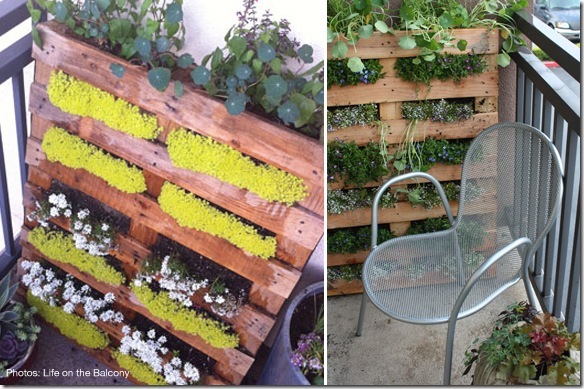 In addition to a great planter, pallets made into planters act as a great privacy screen as well! When starting a modern urban garden, you need to first do an assessment and determine the best methods of gardening you can manage given your lifestyle, space, desired vegetable output and amount of sun. For example, if you aren’t home often or you travel frequently, you need a consistent method to water your garden. 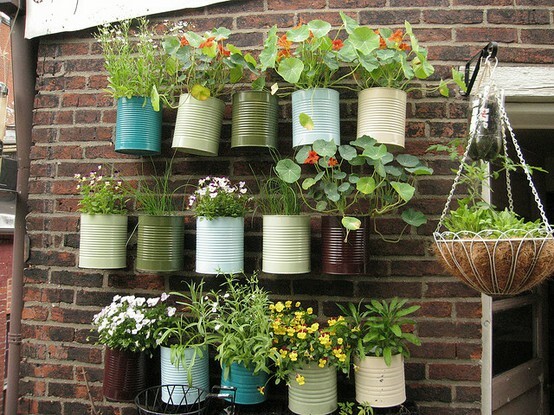 If you have a patio or a simple window box, you may want to consider container gardening. For most vegetable gardens you need as much sun as possible throughout the day. 8-12 hours is the optimal amount of sun. If you don’t have full sun or partial sun the entire day, you’ll want to find herbs or vegetables that don’t require as much sun or choose more delicate plants that won’t need full sun. You’ll need to take into considerations these issues before you get started. In this post, we’ll be focusing on how to infuse simple, modern design techniques into your garden space. We believe it is important to let your garden be the center of attention and a conversation piece. You can’t do that if you are embarrassed to have people look at it. We’ll offer some simple suggestions that you can get started on right away. The concern for many is that modern design is expensive. However, it doesn’t have to be. We are constantly scouring through Craigslist Free Section to pick up free or salvageable building materials. We also rely on getting great deals at the Habitat for Humanity stores. In fact, just this weekend, we picked up an entire pallet of stadium flooring from the LA Kings practice arena for free to use to build an insulated garden shed. The key is get creative to see the modern design through the discarded materials. In the case of the hockey flooring, it’s thick and insulated to keep the ice from melting underneath it. So it will make perfectly insulated walls for our shed. 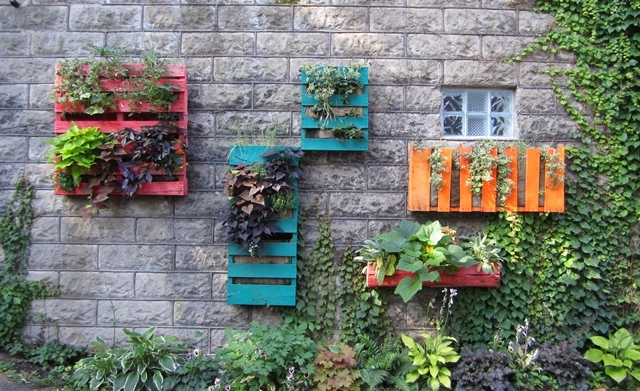 Another fun trend we’ve seen is the use of shipping pallets for use in a multitude of ways. Above, several pallets are painted and add cheerful color to the backyard. Sunset Magazine also just featured an article on how to make a picnic table out of shipping pallets. 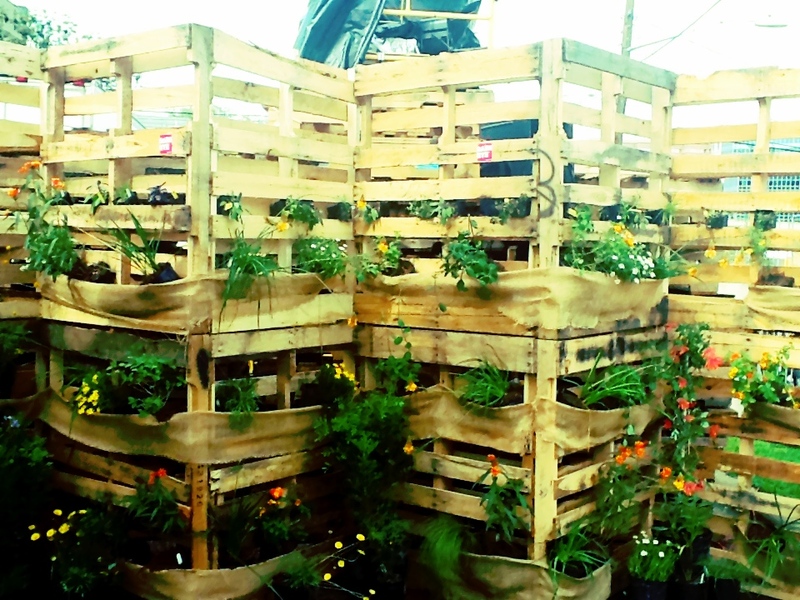 We were at the South by Southwest music festival this year in March and Whole Foods Market had several green projects on display, including some great pallet planters. 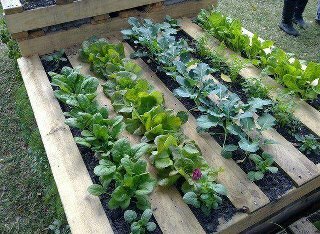 The great thing about pallets is that they are often found objects that you can get for free and have a clean modern aesthetic that can easily be transformed in an afternoon. Pallets can often be found in the loading docks of grocery stores or behind warehouse buildings. You’ll want to ensure the pallet you choose is in good condition and doesn’t have loose or split boards. You also want to check for nails that may have come loose or are sticking out. Next, you’ll need a roll of landscape fabric, a staple gun with staples, burlap (optional), a hammer and sand paper. When you get ready to plant, you will also want to have potting soil and/or compost along with any seed starts or vegetable plants you want to grow in your pallet. We use our compost mix we create here at Sow Swell Urban Farm. If you haven’t started a compost pile or you don’t have room for one, be sure to purchase the best potting soil containing organic matter to improve soil fertility, structure and texture, and increase biological activity, which in turn, increases plant productivity and produces higher plant yields. A good potting soil mixture for vegetables grown in containers consists of equal parts peat moss, compost and builder’s sand. Compost will provide nutrients that vegetables need in order to build disease-resistant plants. Peat moss holds nutrients and releases them slowly, as well as retaining moisture for your vegetables. Builder’s sand improves drainage and prevents soil compaction and root rot. Vegetables that do well in containers include lettuce, cucumber, peppers, cabbage, tomatoes, squash, potatoes and strawberries. And your pallet is essentially a vertical container. Prep your pallet by sanding any rough edges, hammering any nails that may be sticking up, add nails if a board has come loose. You will next cover the bottom, back and sides with the landscape fabric and staple it with your staple gun. However, leave the front area where your plants will go, between the slates uncovered. Lay the pallet face down. Roll the landscape fabric over the back. Cut two identically sized pieces that are long enough to go from the top edge of the back of the pallet and wrap all the way around the bottom, plus a few extra inches. You can then cover the landscape fabric with burlap. This is optional and really more of an aesthetic issue as to whether you want your landscape fabric exposed or not. Ensure your landscape fabric and burlap are pulled taut. You want to retain as much soil and keep it from seeping out during waterings and rain. Painted tin coffee cans offer a splash of color that can add whimsy to an often muted modern color palette. Cans can be affixed to a wall or hung on hooks or attached to a peg board. Dial up the modern and leave them unfinished or clear coat them to protect from rain and watering. You can also let them rust, which is also very modern, but be sure to keep your plants a live or else you run the risk of your cans looking more like an abandoned shipping yard. We suggest you drill a hole in the base to allow for proper drainage. 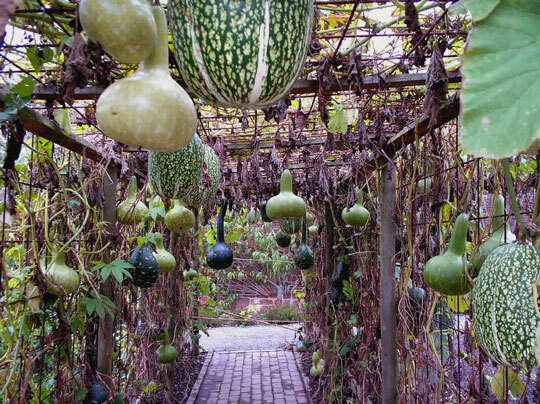 Climbing and vining vegetables like squash and melons are lovely, trellised, as in this photo. Do you already have an arbor? What a perfect way to give it some life. This one here uses posts affixed with wire mesh to allow vegetables to climb. As many climbing vegetables are seasonal, you may want to plan from season to season to minimize the barrenness of the arbor. Not only is this modern, but it’s also romantic! This is an image of a ladder shelving unit, but an old ladder can also be used also. This is very modern in it’s efficiency. A ladder allows for a smaller footprint and keeping things vertically aligned gives the appearance of bigger space. 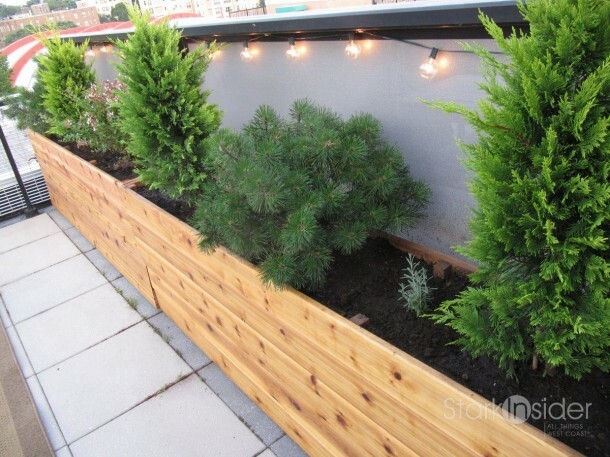 This works well especially in small spaces like balconies and patios. In this photo, small rails were installed to secure plants, but this can also be accomplished using bungee cords. 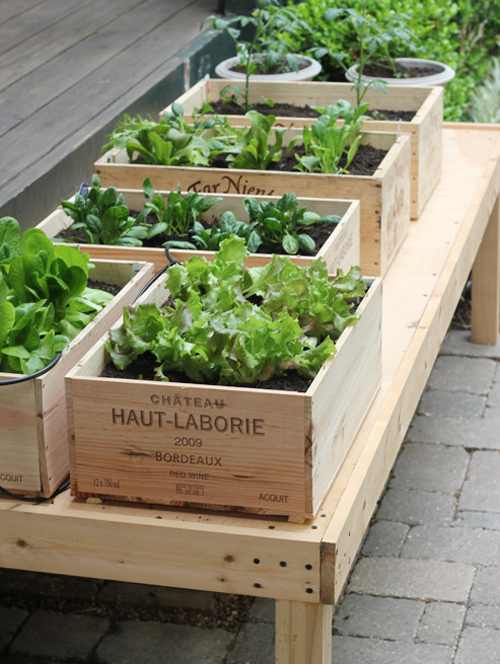 We absolutely love the idea of repurposing wine crates to create mini garden boxes. 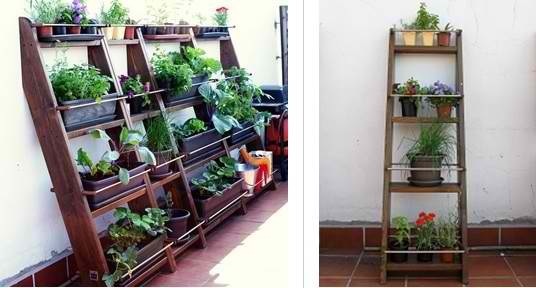 It is a perfect solution for small spaces. Plus, boxes can be clustered together for a modern mosaic of vegetables. Simple, gorgeous and easy. 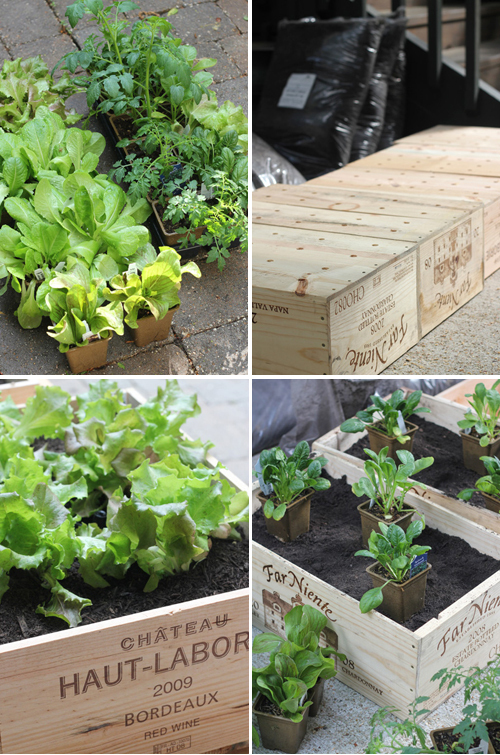 We grow our lettuce in wine crates, which makes it easy to lift and carry into the kitchen for easy harvesting. 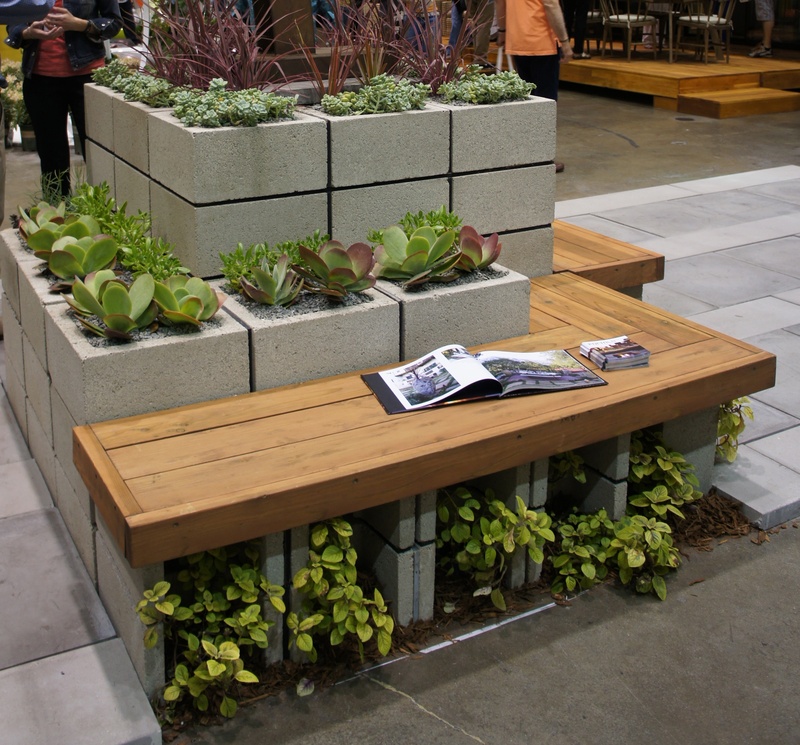 Cinder blocks don’t typically jump to mind when you think of beauty, but here their clean lines and modularity offer lots of options to design your own planter. In the second photo, a bench was installed for functionality, but the addition of wood warms up the coldness of concrete blocks. 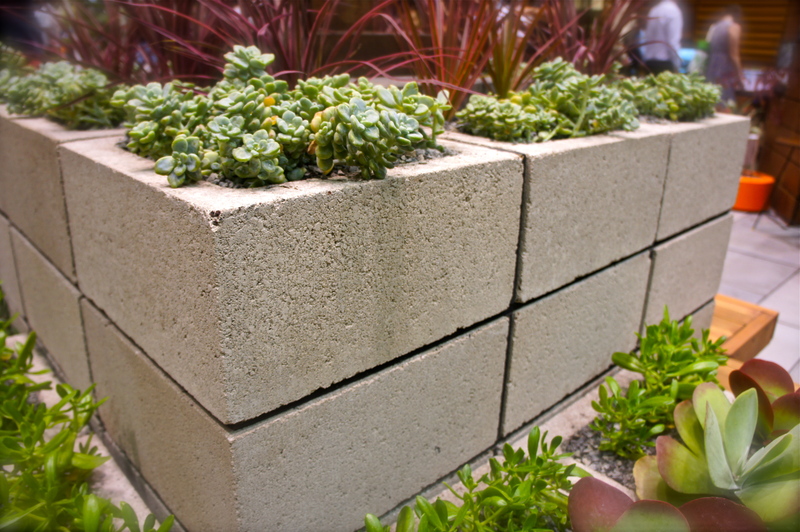 When you’re short on space, edging your patio or yard with a slimmer garden box offers a great option when all you have is concrete. This slim profile also makes it easy to harvest vegetables, but has a depth that will give you enough room for proper root development (typically 2 feet is plenty of depth). As in this photo, these types of boxes also work well for hedges as well and offer greater height than planting directly in the ground, if you need extra privacy. We hope these ideas have sparked some swell inspiration and will get you sowing this weekend! When you get started on your own projects, we’d love to feature them here. Please keep us posted on how you’re making your world more swell! This entry was posted on August 21, 2012 by Sow Swell in Micro-farming, Organic Gardening, Urban Farming and tagged modern gardening, urban agriculture, vegetable beds, vegetable gardens, vertical gardening. Sow Swell at Artisanal LA & Our New Site! GMO OMG — See the film this weekend! Share your email and we'll let you know about swell stuff we're doing!